We recently dealt with a situation that I never really thought could happen to us. We’ve been through numerous tornado warnings (several were very close calls), but we have NEVER had to deal with the threat of a fire! Yes, we live in an area with a lot of wooded areas and ridges, but we had never really thought about the possibility that it could/would threaten our home. So, when the ridge across from us caught fire, it suddenly became a very real threat. I won’t go into the fact that the fire traveled about 2 miles over a 3-day period, or the fact that our local county took THREE days to call in the local forestry division to help them deal with the fire. We were so blessed that, even though the fire was in a very heavily wooded area, it mainly just burned the low brush and fallen trees. But, the biggest blessings of all was that none of our dear neighbors were hurt, none of the fireman or forestry men/women were hurt, and no one lost their homes! So, why am I telling you about this? Not very exciting, right? Well, I didn’t say that it never came close to any homes, because it actually came within just a few hundred feet of THREE homes. We were also supposed to have a very high chance of thunderstorms with strong winds, but God was gracious and allowed the storms and winds to hold off, which allowed the fires to stay low. 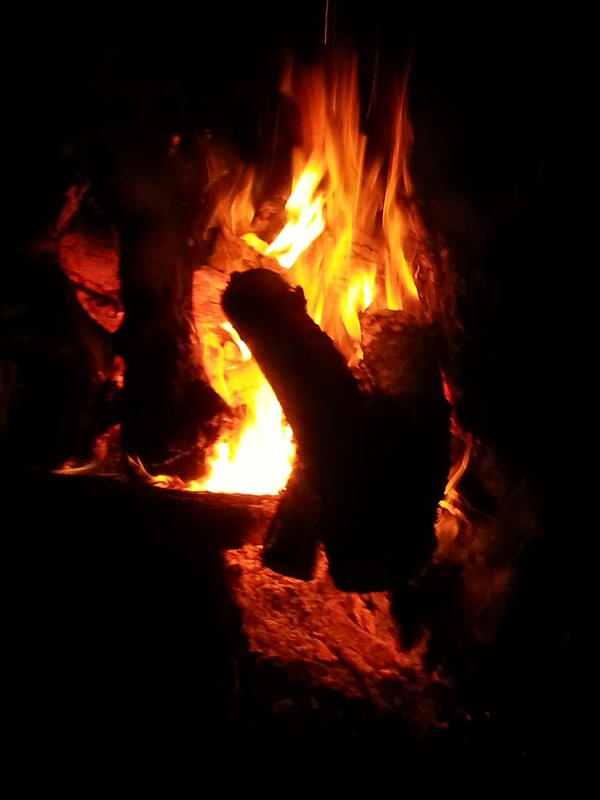 Otherwise, there was a very real chance that the fire could have gotten worse and jumped the road to our side. When the fire was quickly starting to get worse (for a short time before it was brought under control), we had to take a serious look at the situation and decide what we needed to grab to take with us in an emergency. My sweet husband and I took the time to discuss these things and, while we still have several kinks to work out of our plan, I know that, should this threat ever happen again, we will be as prepared as humanly possible. Ultimately, it will be in God’s hands. With our being in the heart of tornado season here in East Tennessee, we need to make sure that we are prepared as we can be. If you are like me, you like to keep a well-stocked pantry, not only to help out with the monthly grocery budget, but also to help out when times are tough (i.e. money is tight, sickness, job loss, etc.). For me, it is very comforting to know that I always have food on hand to feed my family, no matter the circumstances. It is one less thing we have to worry about, especially when times are tough. But, it honestly doesn’t matter if you have a few days or a few months worth of food on hand if you don’t have a organizational system in place to help you keep track of it all! If you go to the store to buy groceries & you have no idea what you have on hand already, you will end up buying duplicates of items that you already have, AND items will go to waste because they get lost in your cabinets/on your shelves/in your refrigerator or freezer. Not only are you throwing items away, but you are also throwing your hard, earned money away in the process. When you throw items in the trash, picture yourself throwing away a $5 bill, $10 bill, or even a $20 bill, depending on how much you are throwing away. OUCH! That really stings, doesn’t it? Here are a few tips that I have that have helped me keep my pantry more organized (not perfect, but better organized), & it keeps me from throwing out a ton of unused items! *Keep like items together: Either on a shelf in a pantry area, cabinet, freezer, or refrigerator, make sure that you keep like items together. A few examples would be to keep herbs/spices together, keep condiments together, keep like canned items together, keep all like meat items together (beef, chicken, fish, etc.) etc. *Make a weekly/biweekly/monthly menu plan: I know a lot of people who have said that they can’t menu plan. The reason? Because when they’ve done it in the past, they’ve not been able to “stick to it” & ended up wasting food. They key to menu planning? FLEXIBILITY! Yep. That’s it! When you plan a menu, always remember to be flexible. You can’t plan sickness, last minute meetings at work, deaths in the family, unexpected trips out of town, etc. Be willing to change things around. *Shop at home first: Before you even grab your shoes to head out the door, grab your menu & see what you already have at home that needs to be used up. Make your grocery shopping list accordingly. *Only keep items in your pantry that you KNOW that you will eat/use! Just because it’s on sale doesn’t mean that you need to buy it! If you’re family will not eat it, then you might as well throw it away as soon as you get home. Remember that mental picture of throwing $5 in the trash? 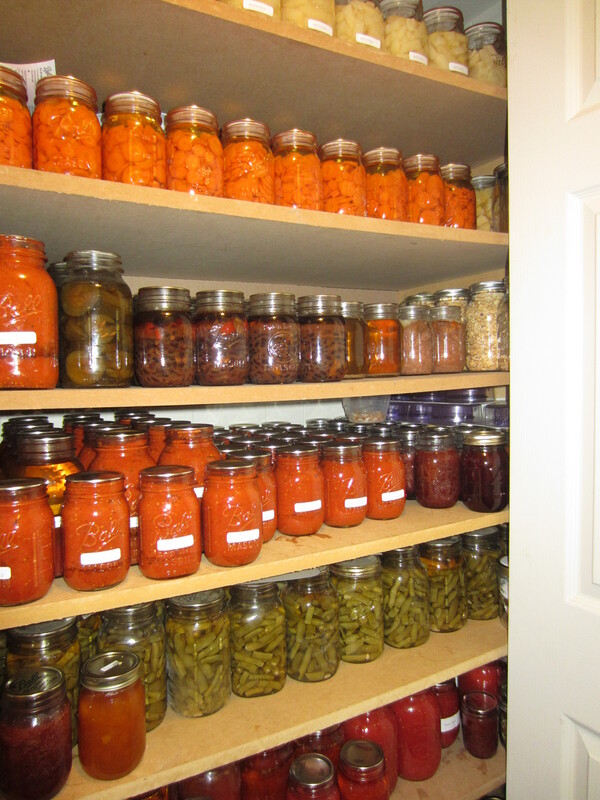 *If you are storing several months worth of food in your pantry, make sure that it is stored properly in air-tight containers. If the food isn’t stored properly, it will not last as long as it could & you will end up throwing it out. Always remember that, just like snowflakes, no two pantries are alike. Everyone’s family eats differently & doesn’t like the same items. Just because your best friend stores pinto beans in bulk in her pantry doesn’t mean that you will do the same especially if your family doesn’t like pinto beans. One last tip. If you don’t already have at least 3 months worth of basic items in your pantry, I would strongly suggest that you do so. Again, you never know what life will throw at you & when emergencies will arise. It’s always smart to be prepared. And stocking your pantry will not happen overnight. It will take time. Start by setting aside $10-$20 of your normal grocery budget to start buying extras of items that you use on a daily basis (i.e. coffee, sugar, flour, salt, canned fruits/veggies, etc.). Stock up a little bit at a time as the items go on sale or as you can afford. It will take time, but you will be so glad that you did! Well, they are 12 weeks old now. It’s kind of hard to believe that it’s been 12 weeks since I brought them home. They have grown by leaps & bounds, & they are doing very well. We did have a fox discover them, but, thankfully, it only managed to pick off one pullet before we discovered it & sealed up the area where it had managed to get it. 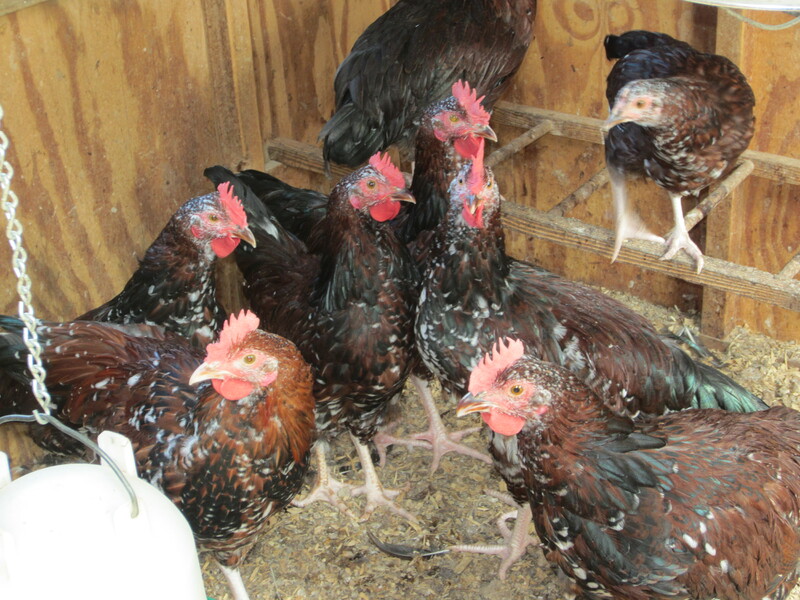 In about 6 more weeks, I’ll begin integrating them in with the rest of the coop. In about 8 more weeks, I’ll start getting eggs from these beauties! I can’t wait! Things have been busy, as usual, around here. But, I thought that I’d give you a quick update on how the garden is doing. 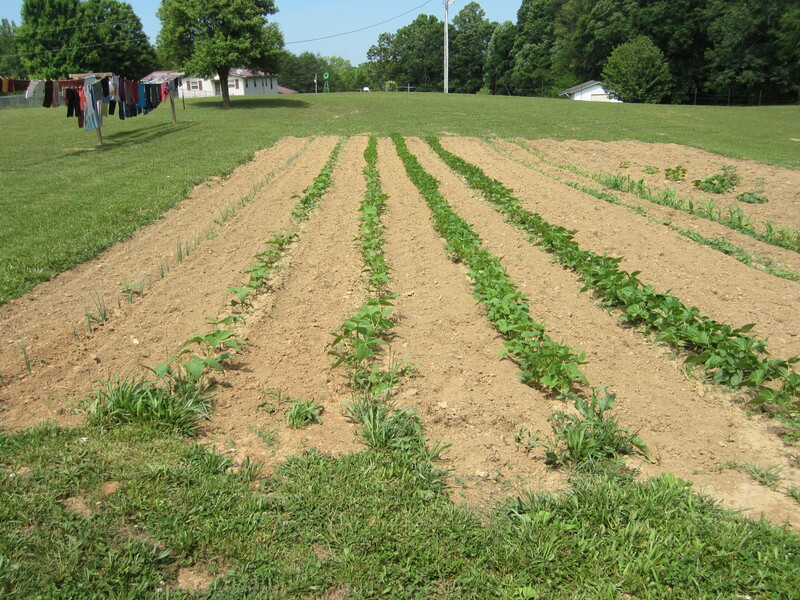 The onions & beans are coming along nicely. 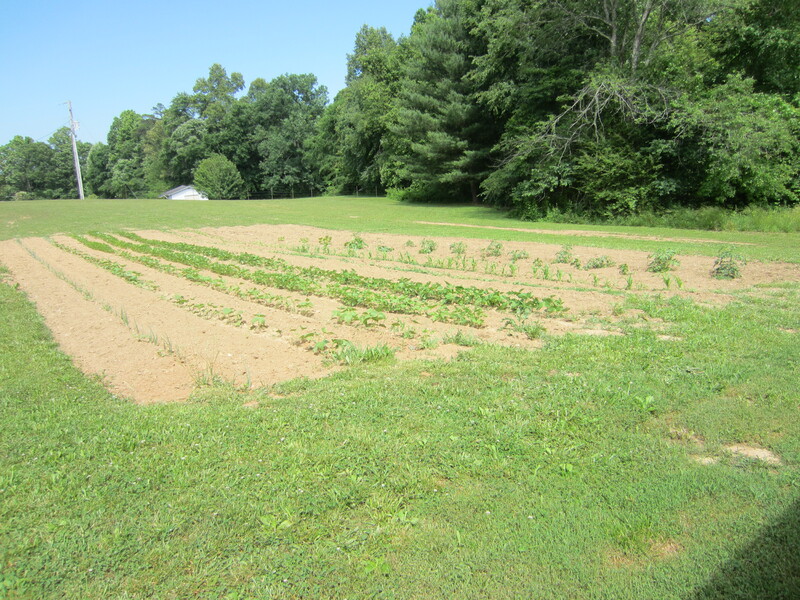 The carrots never did come up, so that row was tilled back under, and I will be planting more beans in it in the next week or so. 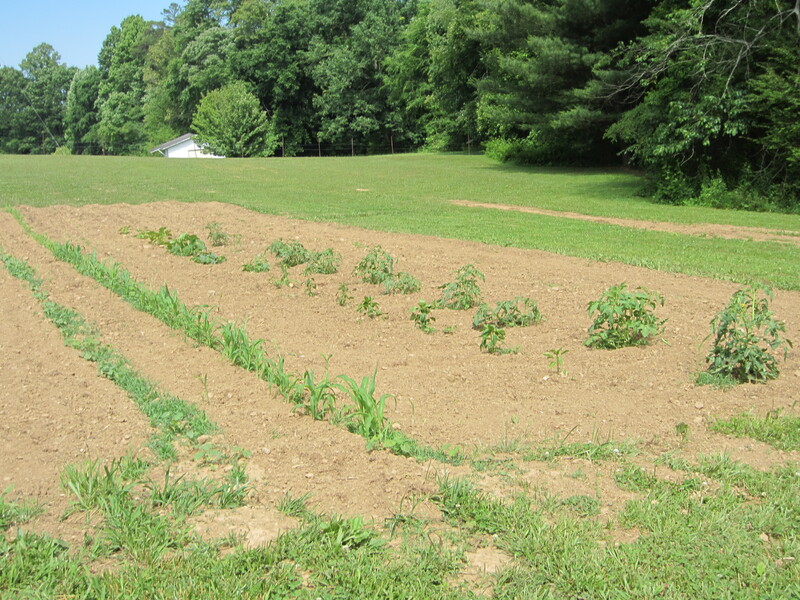 Here is a pic of our okra, corn, pepper, squash, & tomatoes. 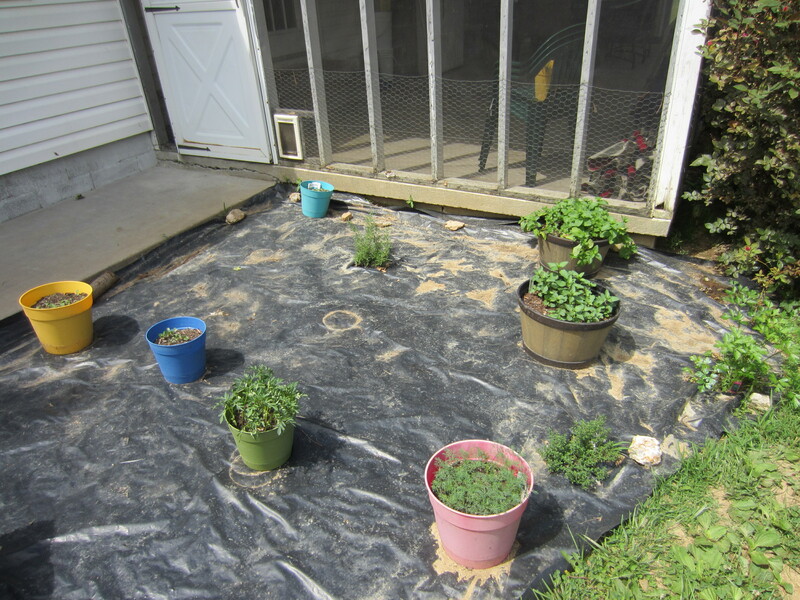 My herb garden is also coming along nicely. The only thing that didn’t come up that I planted was chives. 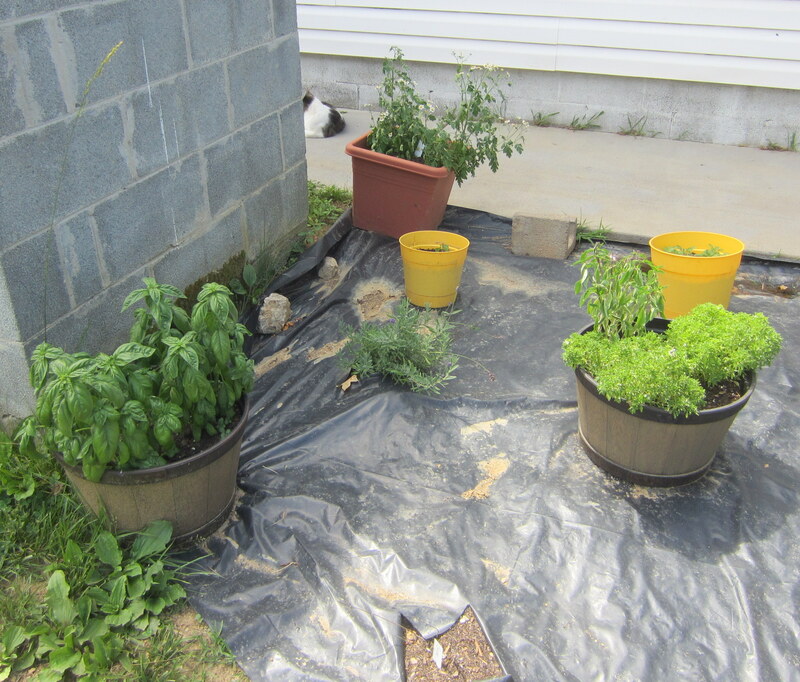 My marigolds, dill, echinacea, parsley, cilantro, sage, & some basil that I planted from seed have all come up & are coming along nicely! 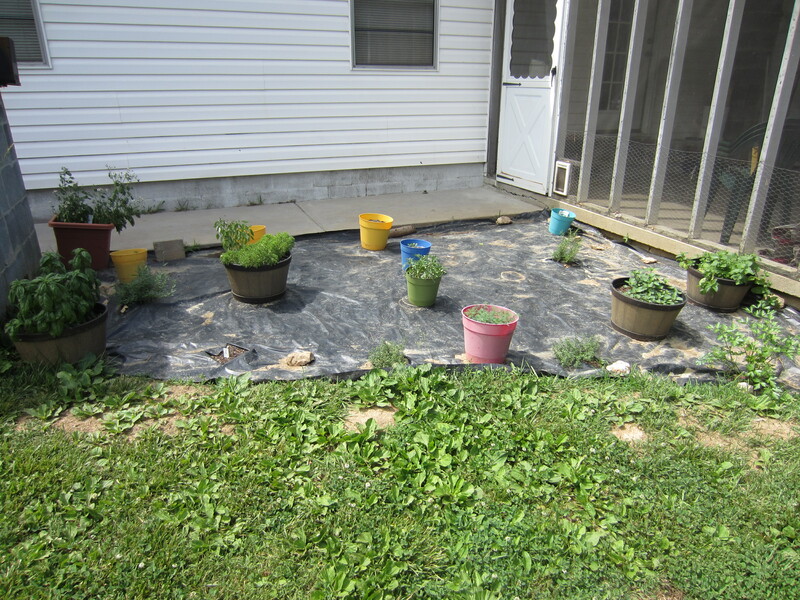 As soon as they are ready for planting, I will get them in the ground, & then I’ll be ready to mulch it all! 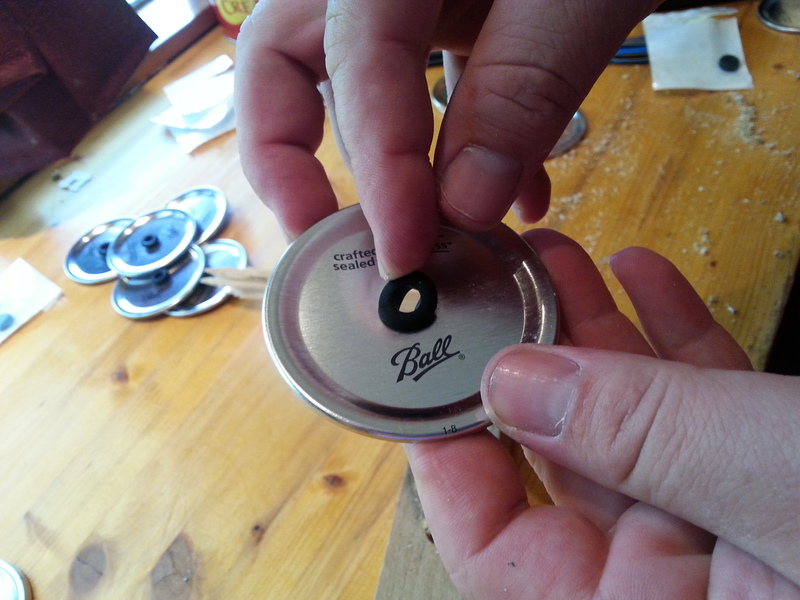 It won’t be long before I’ll be sharing with you about all of my canning endeavors! I can’t wait! It’s always a lot of hard work, but I look forward to it! 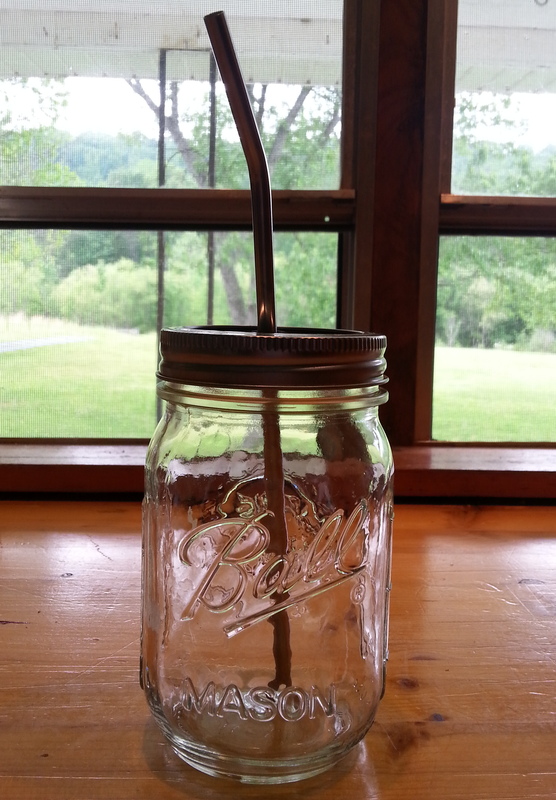 Turning A Mason Jar Into an On-The-Go Cup! 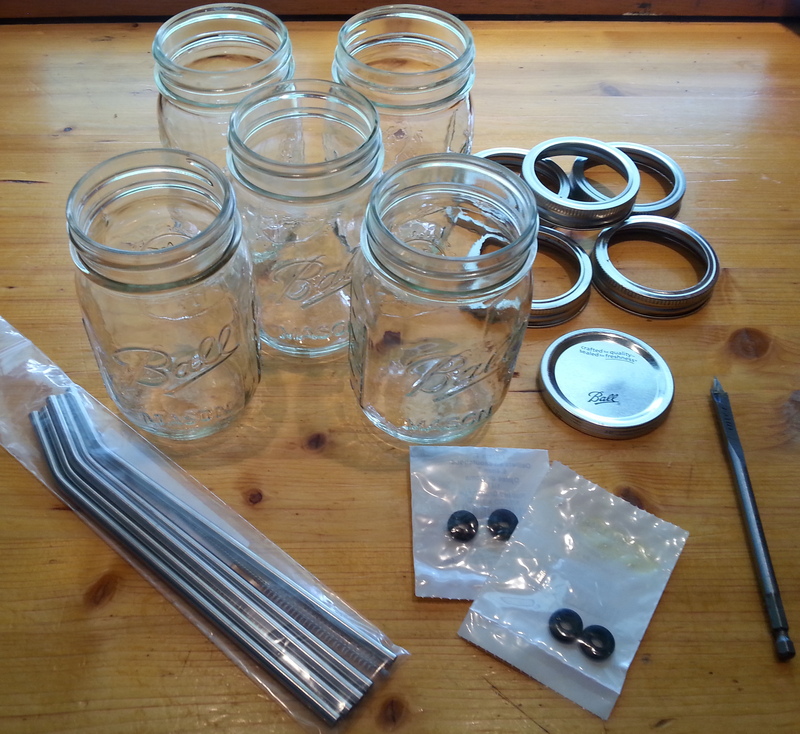 I’ve been seeing online where people were turning a regular mason jar into a to-go cup and absolutely love the idea. But, even though I know the prices I have seen them charging have been fair, I still have an aversion to paying for something that I can make myself. So, with the help of my sweet husband, Brian, we made 10 of them ourselves. 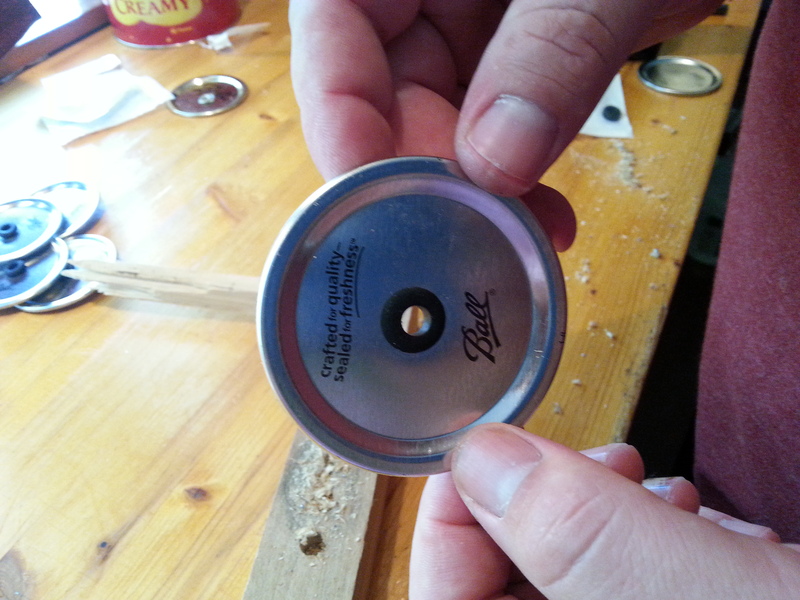 Using your scrap piece of wood, drill a hole in the middle of the seal (or just off center, whichever you like better). 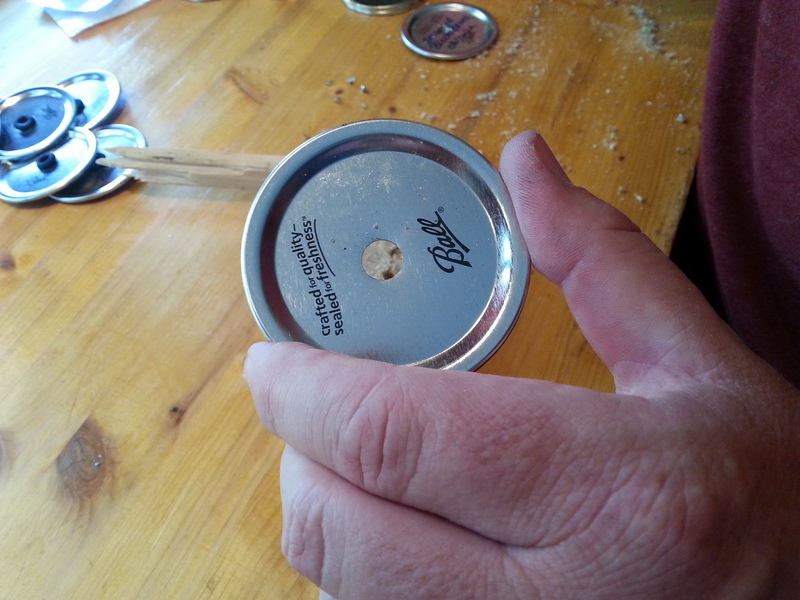 If you read my post on how to make mason jar soap dispensers, you will know that by running the drill in reverse, you will still be able to drill your hole, but the bit will not grab the seal as badly or leave as rough of an edge. 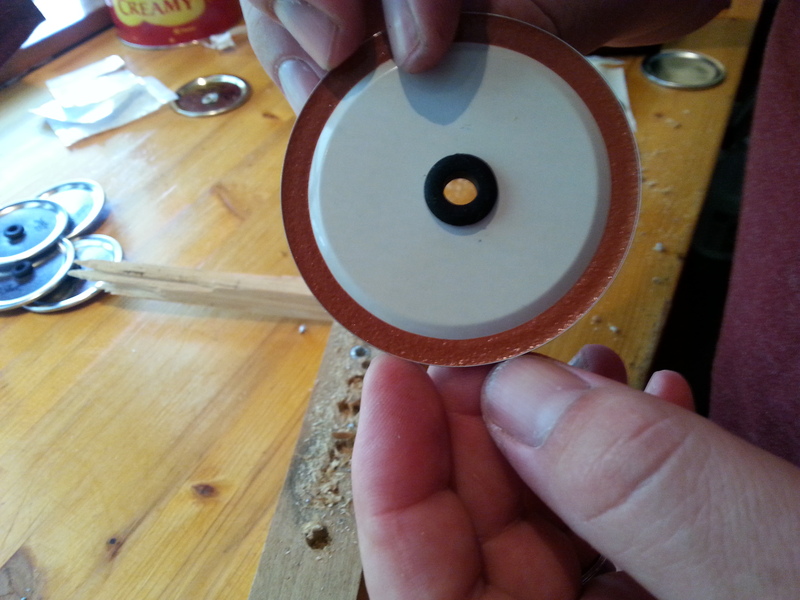 Insert your grommet into the hole you just drilled. Now you’re ready to put it to use! Enjoy! These have already become a favorite in my family. We made 10 the day we made these. I’m sure we will be making more in the near future. These would also make great gifts for family, teachers, friends, etc.